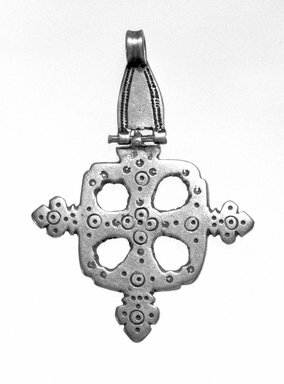 Silver neck cross in shape of a square. Notched tringular-like forms extend from each side and from the bottom. The square is pierced by four round holes. The surface is incised with circles and dots. The reverse is smooth except for a few dots. At the top is a hinge to which is attached a solid triangular like finial which is surmounted by a ring for suspension. Two rows of small dots decorate each side of the triangle. CONDITION: Very good.